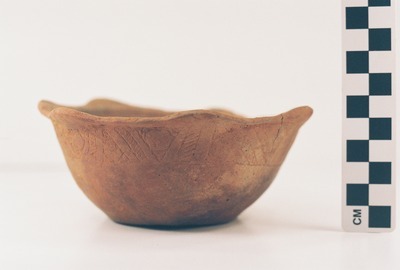 "41AN34, 93, 5" by Timothy K. Perttula and Robert Z. Selden Jr.
DECORATION: The upper part of the vessel has an engraved motif repeated eight times around the rim, beginning under the rim peaks. Each motif consists of two engraved triangles—one with its apex pointed down and the other with its apex pointing up towards the rim—with hatched corners. The opposed engraved triangles are separated from each other by diagonal hatched ladders or narrow zones. Poynor Engraved, var. F bowl in Feature 93 (Vessel 5) at the Lang Pasture site.